When we meet and talk to people, there are often questions about Firefox, how the release shedule works and what different channels we have for testing. Therefore, I’d like to introduce you to/remind you about them and also let you know where the most important testing is, both for you and for us. 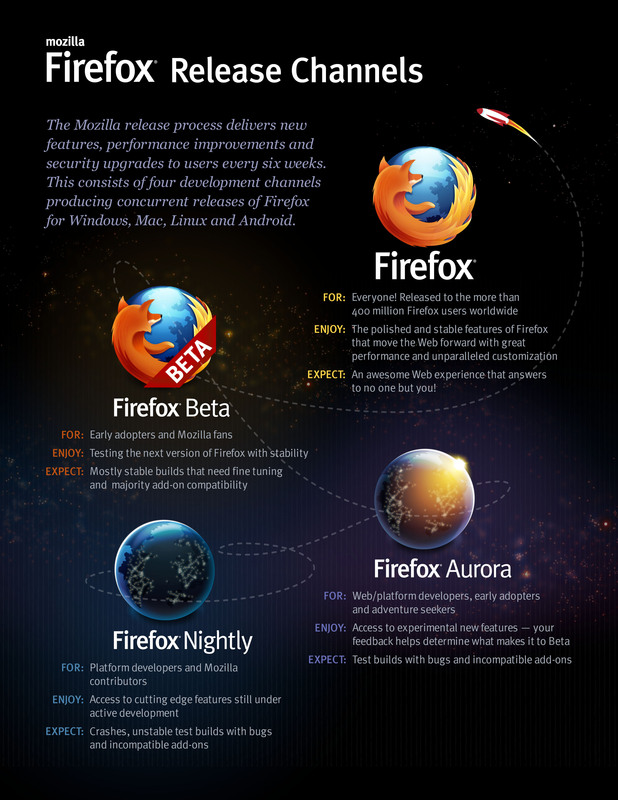 The official release of Firefox. Testing the next version of Firefox befire it becomes the official release. For web/platform developers and early adopters. Firefox is released on a six week schedule, meaning that every sixth week there will be new versions of Firefox Release, Firefox Beta and Firefox Aurora. Nightly is, naturally, released every night. There are many different ways of running multiple versions of Firefox at the same time. What it all comes down to is setting up different profiles that you have per each web browser instance. The easiest way is most likely to use the Profile Manager, as described on MDN. If you are on Mac OS X, it’s easy to use the automated version of setting up multiple profiles of Firefox. The version of Firefox that is the best version to test for web developers is Firefox Aurora. It is in a stable enough condition to use, but also has features at their latest stage before they become approved. Therefore, your chance to affect implementations, find bugs, improve features is when it has become Firefox Aurora – likewise, it gives us a better chance to ensure that when Firefox is officially released, all the things are in place in the best possible manner. Therefore, please take the time to test out Firefox Aurora and new features, so we can together help Firefox and the web better! I’ve been a convinced Firefox Mobile user on my SGSII, but lately Mobile doesn’t seem to be following the release train any more, having been left behind at version 10 in Release/ Beta. The Aurora-builds are radically different (native UI and all), but apparently those aren’t deemed ready for Beta yet. Any news on what is happening and when we can expect Mobile to return to the release schedule you describe in this post? 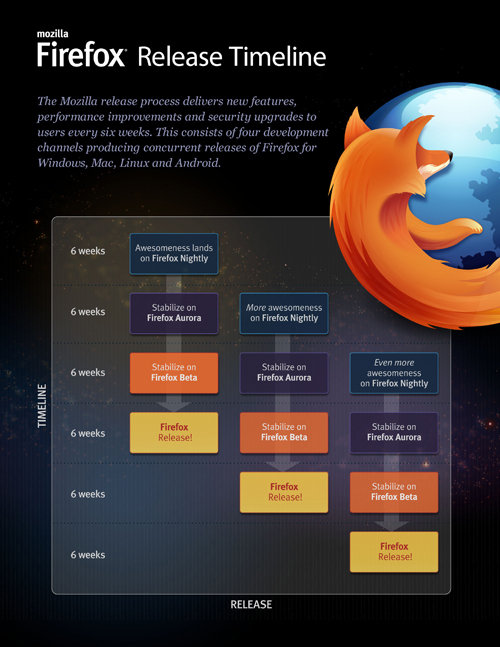 We deemed the changes to Firefox mobile so large that we decided to take it out the above release cycle until we’ve reached a certain state with it. That said, everything you’ve been seeing in Firefox Aurora on ANdroid for some time will soon be in Firefox Beta on mobile. So please, stay tuned, and I hope that it will get onboard the release train soon! Thanks for educatin us about different release channels. When can we expect silent updates? It’s explained more in detail in the Silent Update working document, but basically it consists of varying parts. It will be in Firefox soon. This will be a major step: updates will still be asked but will be very quick. The other phases will be done after this one. Sweet! I always come back to firefox because I prefer the Web Developers add on when developing websites, being a mac user I can now run multiple versions even better! Cheers. Good to hear! You might also be interested in a blog post I wrote about add-ons for web development: Firefox – tons of tools for web developers!. Are you aware of any changes to the ‘internal to Firefox meaning of the “-no-remote” switch’? You have posted an example of a “-no-remote” that is very similar to one I have been using BUT I have run into issues. Interesting, haven’t seen that behavior before. If it persists, or if you find any consistent logic, please feel free to enter a bug in Bugzilla about it.